You see that plaque down there only if you stop and look for it. Keeping track of bicycle-related bills in the legislature put me in mind of Oregon’s pioneer in bike legislation. I’m talking, of course, of the late Donald L. Stathos, a Republican from Jacksonville who served in the House from 1969 through 1972. Don was in the insurance business, and he would often ride his bike the four miles from his home to his office in Medford and back. And in his second legislative session, in 1971, he persuaded enough of his fellow lawmakers to pass the Oregon bike bill. It was the first of its kind in the nation, and it’s still the law, requiring that 1 percent of road spending be dedicated to bicycle and pedestrian paths and lanes. 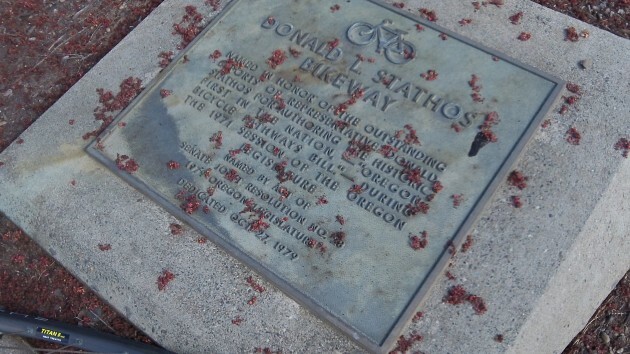 A closer look at the marker honoring Don Stathos. Today, the bike way is marked by road signs, and Stathos is honored by a plaque. Flat on the ground, the marker is hard to find, and you have to know where to look. It is just off the sidewalk on Jacksonville’s North Fifth Street (Hwy. 238) right in front of the Wine Country Inn. I found it today, read what it said, and then checked on the bike bills of 2015. Two of them would require bike registration fees and licensing, and one of these would repeal Stathos’ landmark funding bill, but these bills have not moved. As it happens, though, the House Transportation Committee will hold public hearings Monday (March 30) on two other bills concerning bikes. Senate Bill 533 would allow motorcyclists and bicyclists to proceed against a red signal if it fails to turn green because the pavement loop doesn’t detect them. The bill has passed the Senate. It would be a better bill if it also allowed bicyclists to treat stop signs as yield signs, meaning cyclists could legally roll through stop signs if there’s no traffic. Also up for a hearing Monday is HB 3255, requiring bicylists to wear “reflective clothing” after dark or risk a $250 fine. 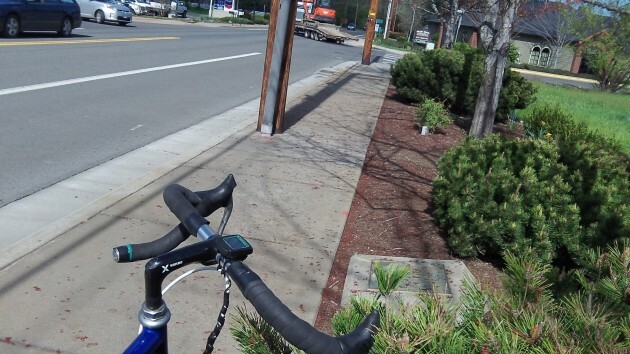 An amendment has been offered, scratching the reflective clothing language but requiring bikes, when visibility is low, to have a red taillight — rather than merely a reflector — visible from 600 feet away. I wonder how many bicyclists are hit after dark vs daylight? I no longer ride at night, simply because I don’t have to. When I did I used front & rear lights. + reflectors. I also had reflective tape on various parts of the frame. I did it by choice, not because of any law. I wonder if the intent of the law is really just to make it easier for the police to spot people at night in order to hassle them? Years ago I used to get off work in the early morning and was frequently pulled over for bogus excuses, simply because the police seemed to think the only people driving at 2-3 a.m. were drunks or up to no good. Your suggestion on the tail light sounds sensible. LED lights are very bright and use minimal power whether from a bike gen or battery. Recently in Portland I saw one that was flashing red, and that really got my attention. and I wonder if they have a death wish!